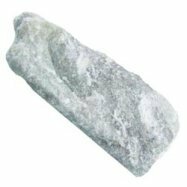 Talc is a metamorphic mineral from the silicate family. Its chemical formula is hydrated magnesium silicate H2Mg3(SiO3)4. It is very soft a 1 on the Moh’s harness scale. It is used to represent the softest of minerals at #1. It can be scratched with your fingernail! The color can be white, gray, or green and it has a white streak. In rare instances it can have a crystalline form but is commonly found in fibrous masses. Talc is commonly used as talcum powder to reduce friction in industrial applications. It was once commonly used as the main ingredient in baby powder to promote dry skin, and prevent rashes. Doctors no longer recommend this practice because it is bad for the lungs and because talc is often found in the same mines with asbestos its purity was not always assured. Now talc is separated into industrial grade and food gradequality..